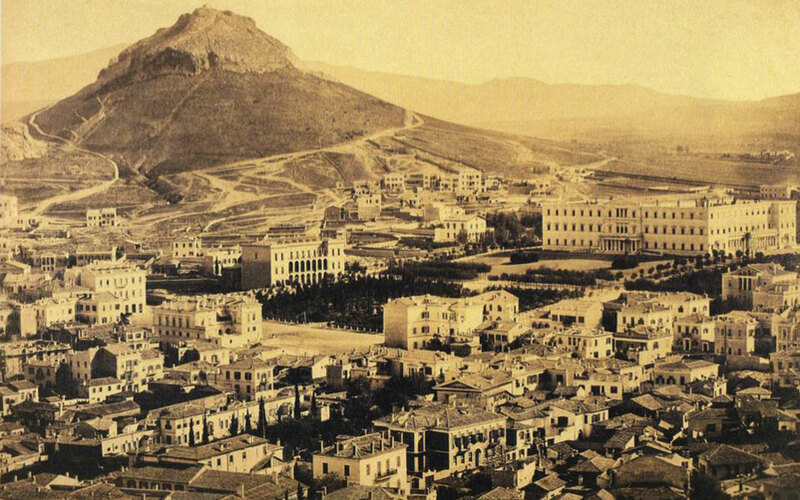 Syntagma and Lycabettus Hill, 1865. Much of what Edmond About describes after a two-year stay in Greece, during Otto’s reign, is still relevant. Greece remains a puzzle, both for foreign visitors and the Greeks themselves. The Frenchman's book, originally published in 1854, captures many contradictions that are still alive and well in today's Greece. The new Greek edition of Edmond About’s “La Grece contemporaine” has been translated as “Otto’s Greece” so as to “correspond with the precise historical time of the original’s ‘Contemporary Greece,’” notes translator Aristea Komninelli. The book, originally published in 1854, could have kept its original title without misleading anyone – because much of what the French journalist and novelist describes and comments on after a two-year stay in Greece, during King Otto’s reign, is still relevant. Greece remains a puzzle, both for foreign visitors and for the Greeks themselves: How can a nation with so many skills and virtues be so incapable of creating an effective state, thus condemning itself repeatedly to poverty and debt? The book, in Komninelli’s fluid and witty translation (2018, Metaixmio Publications, 442 pages), is a guilty pleasure. It elicits laughs through its depiction of familiar traits and behaviors, but also provokes melancholy by showing that the suffering of the country and its people is chronic, perhaps incurable. It provides a caustic and often humorous look at a nation that was still blinded by the light of freedom after centuries of darkness and remained trapped in a vicious cycle of administrative dysfunction, division and corruption, where robbers and state functionaries could trade places easily, where foreign powers exploited the Greeks’ passions but also lost their capital when they loaned it to the new state. The questions that About raises are the same as those we could ask today. How is it that 166 years after this book was written, nearly 200 since the start of the War of Independence, the Greeks continue to torture themselves and to burden their country with the same senseless modes of behavior? The book may be easy and entertaining to read but it is difficult to accept the bitter truths that it reveals, when it describes things that were just as inexplicable then as now, when it functions as a fixed point in time for us to judge our own “contemporary Greece.” Exasperated by the fact that the Greek government does not exploit the country’s rich forests, and does not reorganize its agriculture, About comments: “The country, without being very fertile, could nourish two million people. It has 950,000 and it cannot feed them.” He adds that he cannot provide a precise figure for the arable land because he does not know it. “King Otto and his ministers are just as much in the dark, as they have not created a land register yet.” Greece still does not have a land register. In his prologue – which presents About in the context of his time and describes his book’s reception – writer Takis Theodoropoulos notes, “About’s clear view of things does not flatter our collective narcissism, and so for a long time we had placed him in the ranks of the anti-Greeks, among those whose description of Greece is not wrong or distorted but simply does not coincide with Greece’s own image of itself.” This is a valuable point and part of Greece’s problem. But it is also fascinating to see how About gradually changes as the book develops. After honing his wit on the vanity and foibles of the Greeks he met in Athenian society and in the dusty new capital’s streets, after presenting a number of colorful foreign residents (most notably Sophie de Marbois-Lebrun, Duchess of Plaisance, and Jane Elizabeth Digby, or Ianthe, as one of the time’s most colorful women was known), About ventured into the anarchic countryside. As his visit to the Peloponnese progresses, in the company of architect Charles Garnier and the painter Alfred de Curzon, About witnesses the combination of poverty and dignity of country people and begins to lose his mocking tone. He begins to understand the tribulations and the virtues of the Greeks. The last two chapters describe these encounters and provide much food for thought in the traveler’s mind with regard to the currents of history and the fate of people. “There will always be something inexplicable in the unquestioning love of the mountain dwellers for the soil that does not want to nourish them. The people of Greece’s mountains refuse to emigrate, and when they do decide to leave they want to return to their rocks,” About writes. He came to mock, but About left a wiser man. Like so many other visitors through the ages. And Greece remains inscrutable. Edmond Francois Valentin About was a French author, journalist and member of the Academy. He was born in 1828 and died in 1885. In 1852 he came to Athens on a French School scholarship and wrote about his two-year stay in “Contemporary Greece,” which was published in 1854. A year later he published “King of the Mountains,” the tale of a Greek highland robber who wants to be minister of justice. Both books raised vigorous protests at About’s portrayal of Greece and the Greeks.